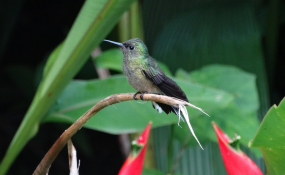 United Nations — There is a Quechan fable about a hummingbird named Dukdukdiya. During a fierce forest fire, while all other animals stood in stunned fear, Dukdukdiya alone took action by repeatedly carrying a single drop of water in her beak to the flames. When asked why she bothered with such paltry efforts, she replied that she was simply doing everything in her power to stop the fire. A new atlas on global desertification, linked to the UN Convention to Combat Desertification, portrays a world struggling to cope with growing water scarcity, land degradation and desertification. And just prior to the annual UN Climate Conference, the Intergovernmental Panel on Climate Change released a special climate report that sent shock waves around the world - stating unequivocally that we have just 12 years to tackle climate change before largely irreversible and profound changes shape our world. These reports, along with droves of supporting evidence and research, have resulted in apocalyptic news stories, with headlines claiming, for example, that 2019 and 2020 are "humanity's two most crucial years" that will determine "to what extent Earth remains habitable." Despite these headlines, and the global media attention to biodiversity loss and climate change, the world seems almost paralyzed to take action. 2018, for example, will be the worst year in a decade for tropical forest loss, and greenhouse gas emissions increased by 2.7 percent in 2018. What is required is nothing less than a system transformation of three basic elements of society: how we provide enough food, water, energy and consumer goods for 7.7 billion of us; how we invest our more than $100 trillion in investable wealth and how we spend our roughly $75 trillion in annual global GDP; and how we protect, manage and restore our world's single most important asset, worth more than $125 trillion annually in goods and services: nature. We know that stemming the loss of biodiversity and tackling our climate crisis will require all members of society, doing all that they can, starting now. Already there are signs of change. Commodity traders such as Wilmar, which supplies 40 percent of the world's palm oil, recently published a plan to completely eliminate deforestation from its supply chain, as part of its commitment as an endorser of the New York Declaration on Forests. Societal transformation takes bold leadership, not only from companies, governments and investors, but from everyone. One of boldest, most memorable leaders during the climate conference this month was Greta Thunberg, a slight 15-year-old Swedish girl with Asperger's Syndrome. Her poignant speech to UN delegates begins with a simple statement: "I've learned that you're never too small to make a difference." Her message, that system change is necessary and is upon us, has been shared on YouTube more than 250,000 times, and she's amassed a Twitter following of nearly 70,000 since she joined in June. Not all of us can easily transform whole businesses, government policy or large asset investments. But we can transform our own lives, and we can have transformative conversations with others. For example, we can ask ourselves, our employers and our religious institutions whether our retirement savings are invested in businesses linked to deforestation, or to fossil fuels, and whether or not they are climate proof - most aren't. We can ensure that events we host professionally offer vegetarian options and avoid food waste - two of the most potent ways to reduce greenhouse gas emissions, and we can talk to others about these choices. There are so many actions we can take and so many conversations we can have in our personal and professional lives that can transform our world. Even if our beaks are very small, and we can only carry one drop of water at a time, what matters most is that we do everything in our power that we can.